I did not know what to expect from Detective Pikachu on the Nintendo 3DS. I knew there was a talking Pikachu with a detective’s hat on. He is helping the son on his quest to find his father. Is his father still alive? SPOILER ALERT! We go through the entire game and still do not find the father in Detective Pikachu. How lame is that? I guess Nintendo and The Pokemon Company are stretching things out into more than one game. The gruff voice for Pikachu in Detective Pikachu annoys me to no end. It does not fit for me. There are multiple voice actors that do not fit for me in Detective Pikachu. The game play in Detective Pikachu is obnoxious. We have to talk to every single character in an area about every single topic. Then we get a new topic and have to go over talking to all of them again. Every so often in Detective Pikachu we get a quick time event. Near the end of a mystery we can make selections to prove we were listening to all these characters droning on about the same things. It is really easy to get stuck in Detective Pikachu. Thankfully there is a hint button (at least on the easy mode) that tells you exactly what to do. I did not try the other difficulty settings. The graphics look decent in Detective Pikachu. There are plenty of movies in Detective Pikachu. 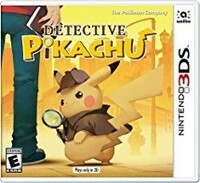 Many times I had deduced what was wrong but Detective Pikachu would not let me try to solve the case. Instead I had to run around and talk to all these characters about all these topics. Detective Pikachu is really annoying that way. The main character is the only person who can understand the Pikachu. Certain Pokemon will do evil things in Detective Pikachu. There is some mild violence in Detective Pikachu as well. The religious teachings of evolution are taught in Detective Pikachu on the Nintendo 3DS. Nintendo continues that controversial practice. I am not that big into this game. With that divulged I would like to see a sequel to Detective Pikachu. I am sure there are those that enjoy this kind of a game.